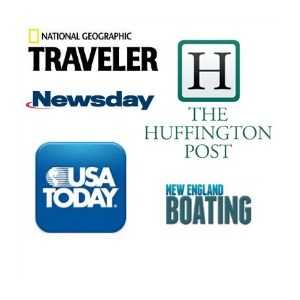 WHY GO: If all you know about “The Hamptons” is what you hear or see on TV, there’s always another side to the story. 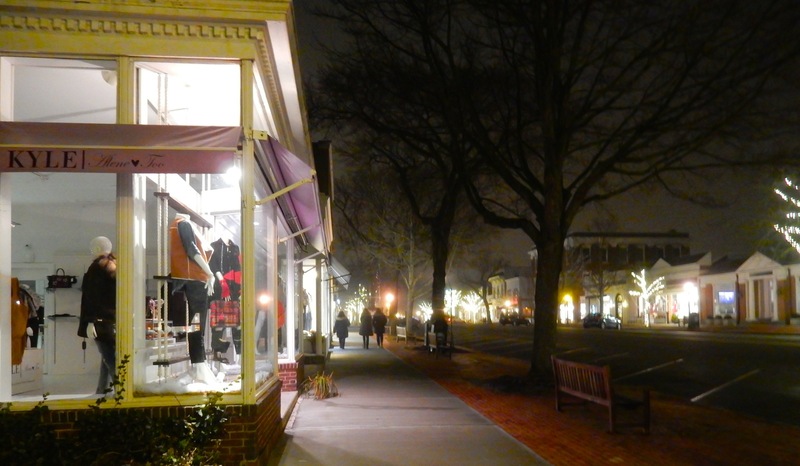 Though made up of several towns, including Water Mill, Bridgehampton, Amagansett, East and West Hampton, and more, the crux of The Hamptons, as far as Arts and shopping goes, is tony Southampton. Sure, Southampton has its share of ostentatiously wealthy people doing only what filthy rich people can do (like build houses that look like Indian palaces right on the beach), and lodging rates are pretty out of control in summertime; but visit off season for a whole other experience. You can stroll the beaches as solitarily as Jane Eyre on the moors, and get a table at a restaurant no problemo. There’s even a newly renovated hotel right in the center of town where you can stay for $159 per night midweek. 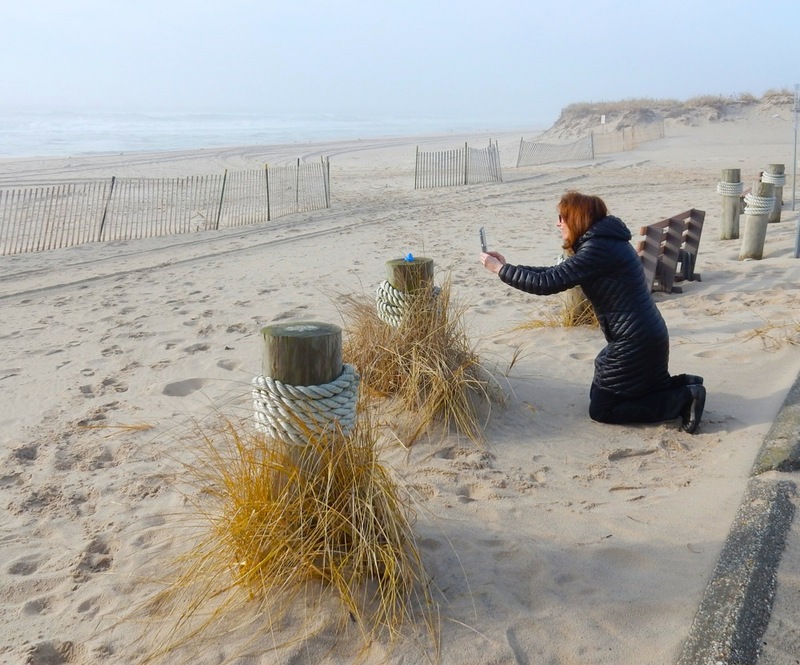 So, read on for the best off-season Hamptons adventure brought to you by the Getaway Mavens. TOUR/VISIT/EXPERIENCE: Long Island Aquarium, Riverhead. 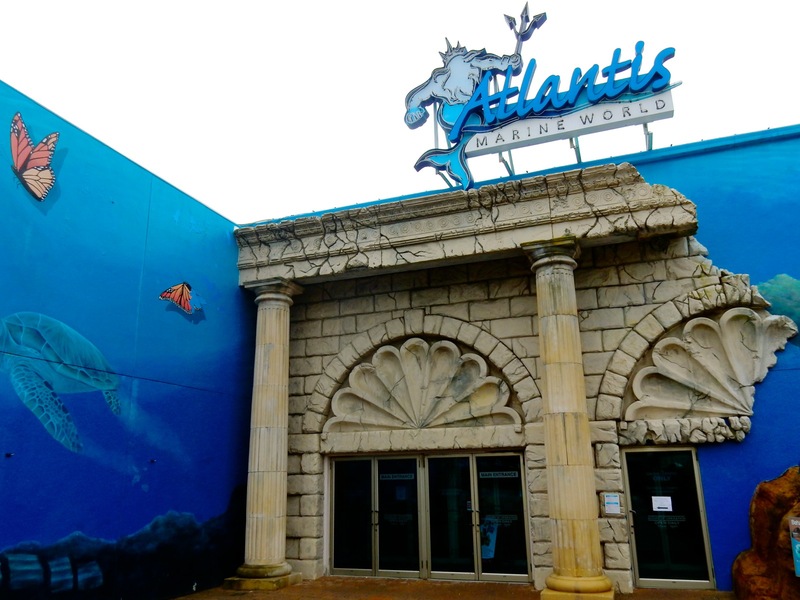 If you’re driving from NYC and you have never been to the Long Island Aquarium, or it’s been years since you have – this home to a cornucopia of sea creatures and mammals, first opened in June 2000, has never been more interactive, compelling, and immersive in the most literary way. A three-person cage plunges you safely into a 120,000-gallon shark-infested tank. This Shark Dive with Dive Master ($165 per person) is so popular, it generally sells out quickly, and amazingly, it’s a hit among certain lovebirds: there were 6 weddings performed in the shark cage last year. But the sharks are just one of the many exciting exhibits and programs available here, and the Aquarium has been adding new ones every year both indoor and out. In addition to the sharks, the aquarium has tanks full of sea life found in local waters – flounder, dogfish, Striped Bass, and the bird-like Sea Robins and Flying Gunards. There are also flesh-eating piranhas and schools of vibrantly colored tropical fish, colors mirrored in the Aviary where jewel-toned parrots squawk up a storm whenever a visitor walks into their cage. Butterflies land within inches of your face in the Butterfly exhibit, bats fly around a very active and sharply quilled porcupine, and Sea Lions shout out greetings (or is that “feed me”) as you walk by. The Japanese Snow Monkeys are as curious about us as we are about them. “The big one likes to come to the window and watch videos on my phone,” claims marine biologist and Aquarium co-founder, Joe Yaiullo. I couldn’t decide what I loved better – the fact that Yaiullo is playing a part in re-propagating the world’s dying coral reefs through Reef Gen, his LI Aquarium-based company that grows a plentitude of coral in a 20,000 gallon reef tank, or his penchant for naming the Aquarium’s 15 South African Penguins after TV sitcom characters, or for that matter, Joe’s fatherly love of these flightless seabirds. (Photo shows Joe with Phil – named for Modern Family’s Phil Dunphy). There is plenty to love about this incredible place, especially discovered through small-group experiences. The daily Behind the Scenes Tour (at 1pm, $5), brings you upstairs to the tops of the fish-tanks, shows you the pumps and filters – “what it takes to make the aquarium look the way it does” – to the food prep area, and to the lab where algae, shrimp, fish and coral are grown. The Penguin Encounter (one to 3 times per day, $50 per person) enables visitors to learn how staff takes care of these engaging creatures and allows you into the fun-loving Penguin Pre-School to meet those cute little guys. In addition to the cage dive, the new “Shark-Keeper” experience encourages visitors to help feed these predators ($50), and joins the animal feeding/training sessions, Reef Snorkeling cove, canoe and kayak rentals, tours on the research boat Atlantis Explorer, the Discovery Tower (a ride that provides 360 degree birds-eye views of the area), archeology for kids, Sea Ray touch and feeding tank, and other exhibits as convincing reasons to come here over and over again. Just 25 minutes from Southampton, it’s a great stop on the way. Open 10-5 daily. $28 adults, $21 kids, some programs extra fees. 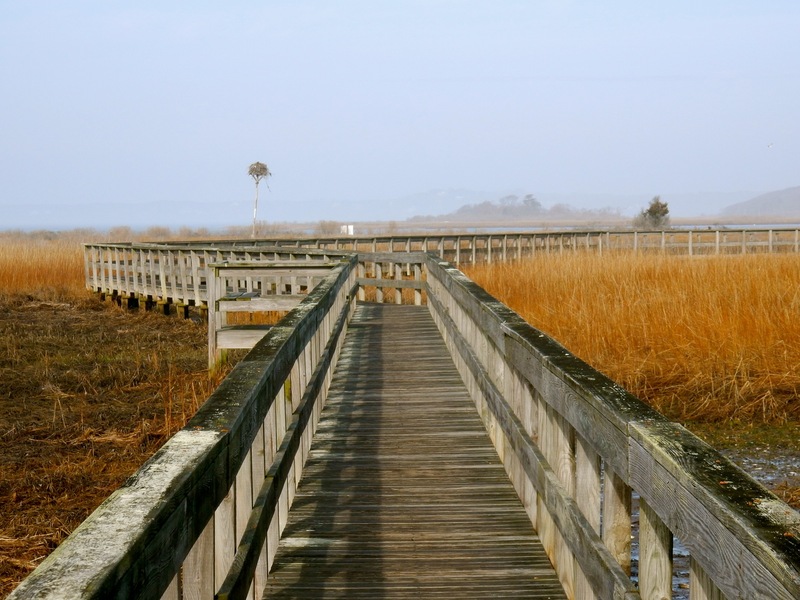 VISIT: Parrish Art Museum, Southampton/Water Mill. 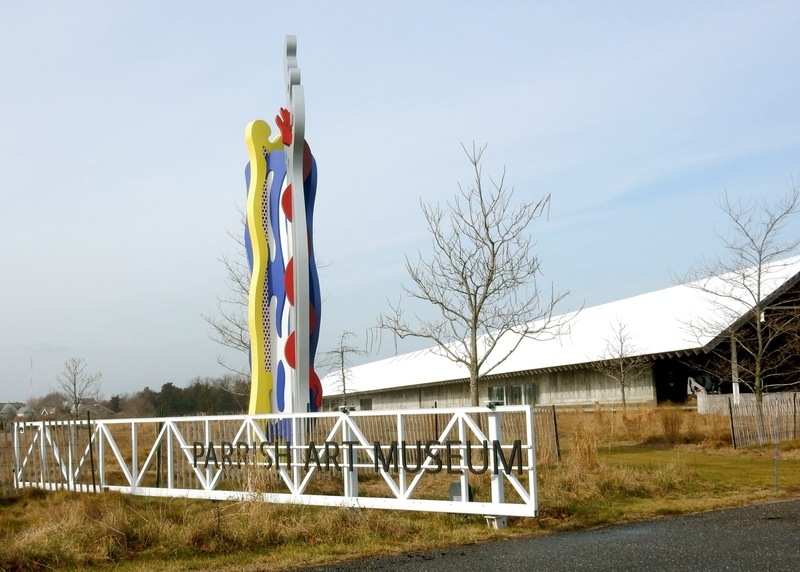 In 2012, the downtown Parrish Art Museum moved into its new expansive digs on 14 acres of meadowland on the border of Southampton and Water Mill. 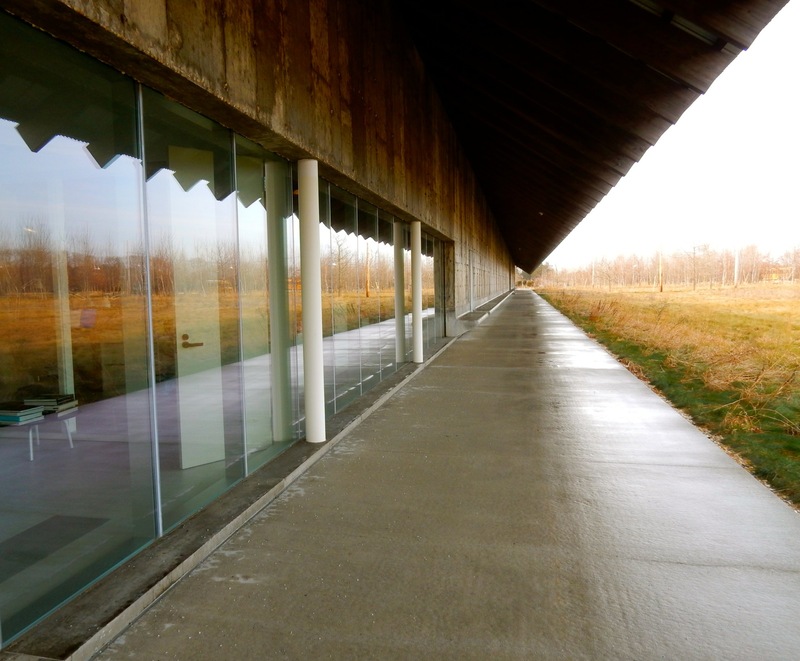 Architects Herzog & de Meuron designed the building to evoke the potato barns and sheds, subsequently converted into artist studios, that were so prevalent in this agrarian section of New York. 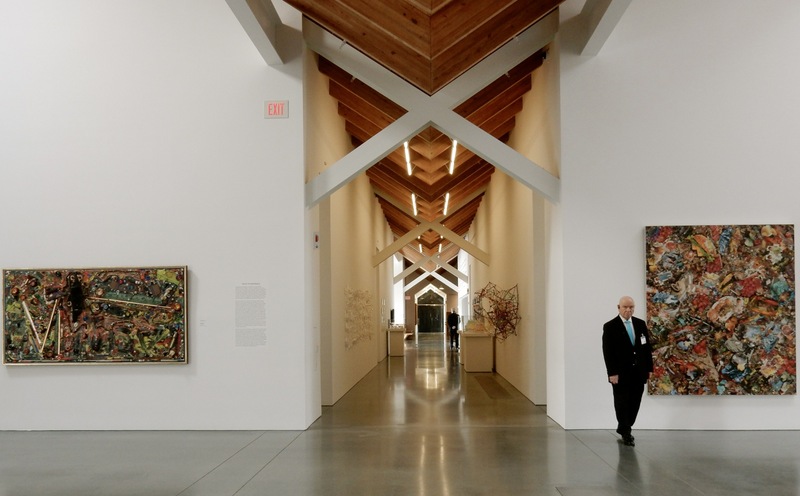 The elongated rectangular structure, a longhouse of glass, poured concrete and wood, is airy and spacious inside, featuring naturally lit well-proportioned galleries, seven of which showcase a rotation of the museum’s 3,000 works, installed annually. 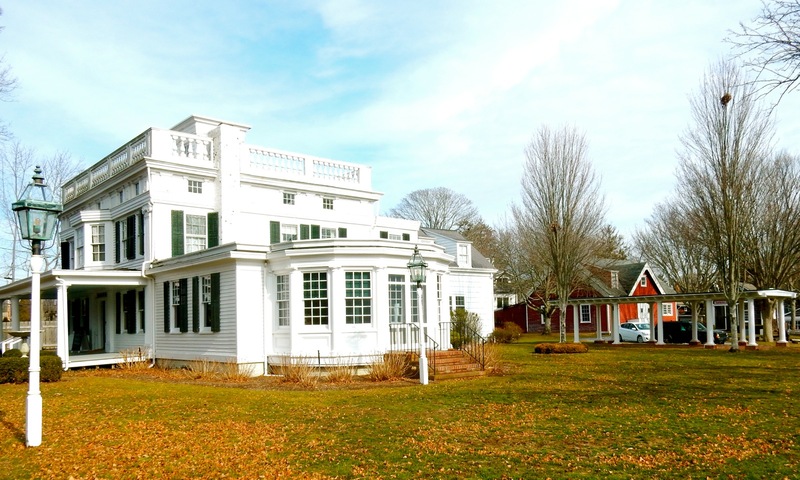 With a concentration on local artists, Fairfield Porter and William Merritt Chase, the Parrish also features other major modern artists, many with some connection – no matter how tenuous – to Eastern Long Island. During the school year, soaring galleries reverberate with the voices of kids discovering the works of established artists and creating artwork of their very own (children’s art on display through February). 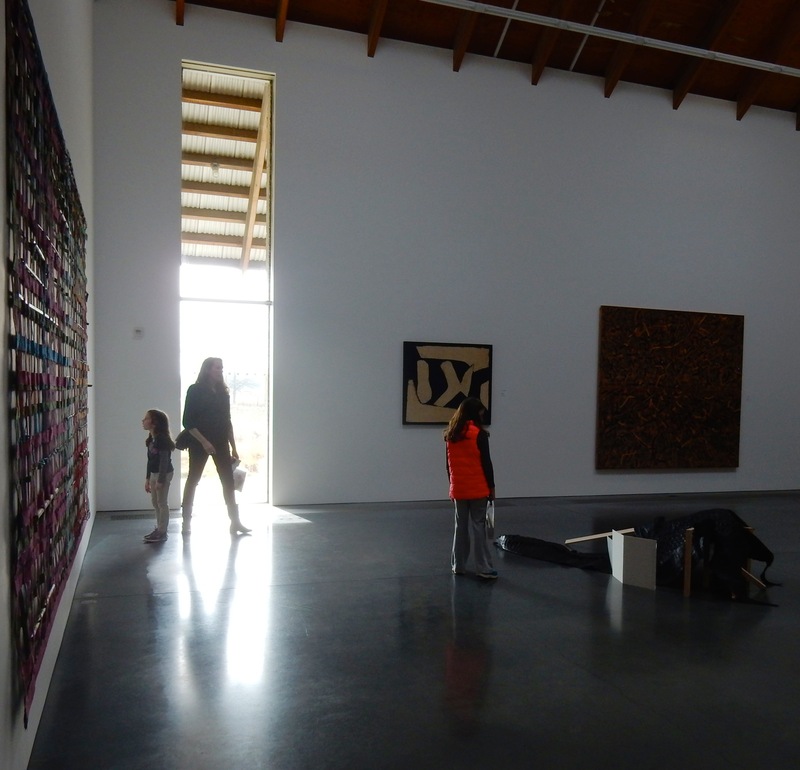 Every Saturday, Sunday and Wednesday at 2pm you can take a guided tour of the museum (free with admission) and on weekends, visitors can take art classes or drop in on open studios. If you get to the Hamptons on Friday evening and are looking for something to do – come for a Public Program offered in the 200-seat theater. Depending on the schedule, it could be live music, a film, one of an architectural series talks, or a lecture by an up and coming (or established) artist. Open Wed-Mon (closed Tues), $12 adults, children and students free. TASTE: Duck Walk Vineyards. 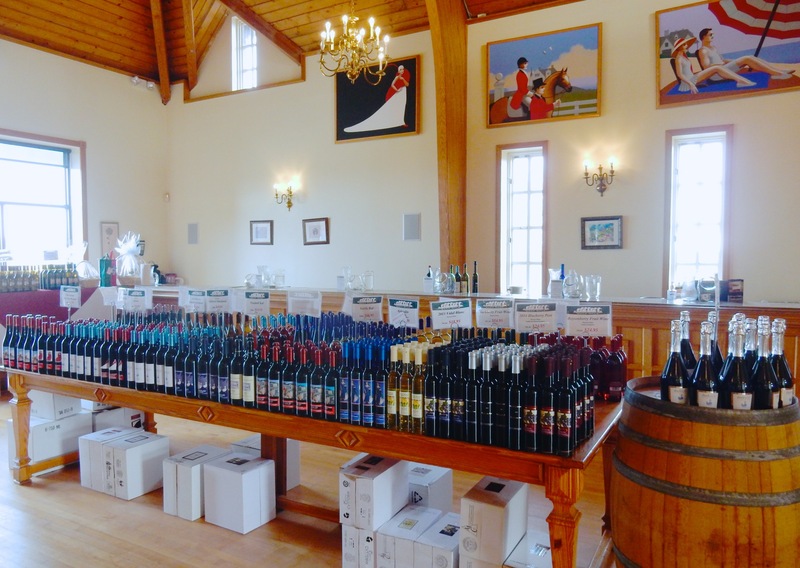 In Southampton for 23 years (North Fork for 10), Duck Walk backs up onto the Parrish Art Museum property – so it’s easy to waddle in to the pretty room and try out a few of your favorite kinds of wine. Known for its signature Blueberry Port ($24.95), a local cigar maker rolls Blueberry Port Cigars just for purchase here. BEACH: Coopers Beach. 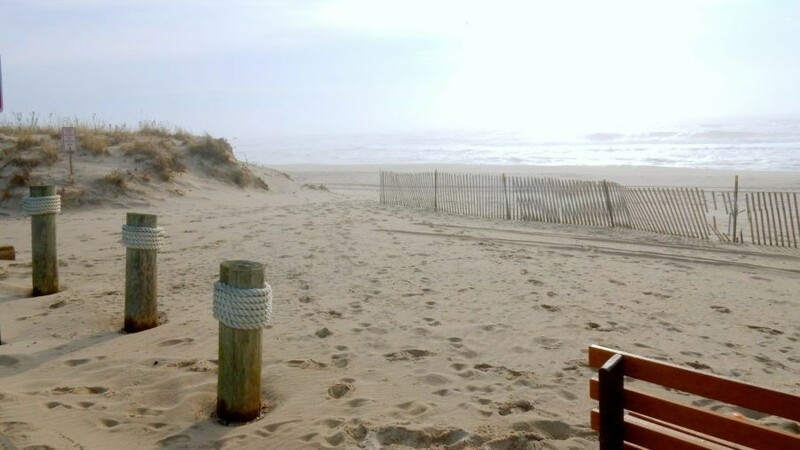 This is the only beach open to the public in Southampton Village, so yes, it does get very busy in the summer (though of course, you’ll have it to yourself in the wintertime). There’s a parking lot (fee), or better yet catch a ride or shuttle there. On Meadow Lane, it’s about a mile walk from town. DRIVE: Meadow Lane. It’s all about the water, salt marsh and mansion views on the few miles out to Shinnecock Point and the Inlet into Shinnecock Bay. Off season, you’ll share the road with a bevy of construction workers who are either building new or renovating older mansions right on the Atlantic Ocean beach, some much more ostentatious than others. Be sure to stop at the boardwalk that goes out to Munn Point. If you’re lucky, you’ll see ospreys in the nest. DRIVE: Gin Lane. 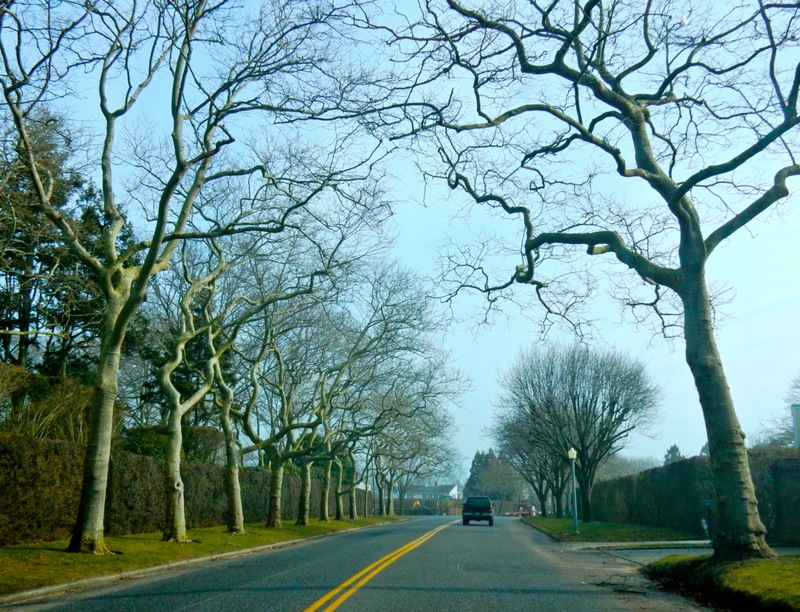 Another seaside street – this one is slightly more “old money” with more modest – or at least subdued – homes. Tall old growth trees, skeletal in winter, line what was surely once a carriage road. VISIT: Southampton Historical Museum. This repository of Southampton history is located within and outside of the large white Rogers Mansion just off Main St. Inside you’ll find collections of community artifacts mostly from the Victorian and Edwardian eras, but it’s what’s on the property I found most offbeat. 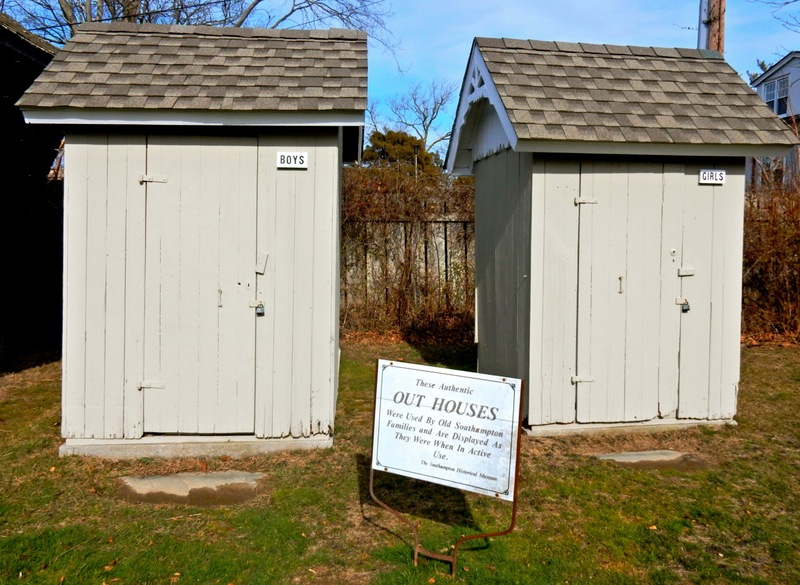 Included in a collection of 12 historic structures, is a one room school house, a 19th century paint store, and my favorite – a pair of outhouses, marked Boys and Girls, with a sign that explains, “These authentic outhouses were used by Southampton Families and are displayed as they were when in active use.” These artifacts at once disabused my notion of the “glamorous Hamptonite” of yore. Open March – Dec. Wed – Sat 11-4. Tamara Comolli Jewelry – funky filigreed leaves and colorful baubles stand out in all the pearl-on-leather-cord mania of today. HomeNature – making rattan, quartz and oak chic again. The resident bulldog is an added bonus. 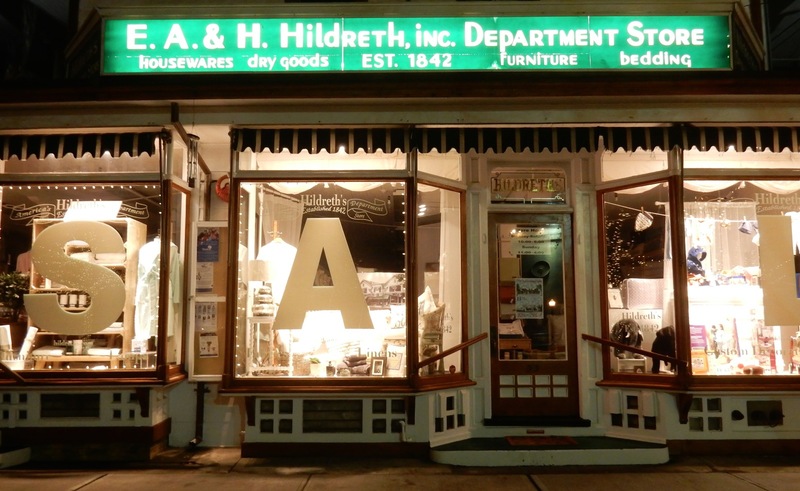 Hildreth’s– at 175 years old, this is America’s oldest Department Store, filled to the brim with home goods and everything, really. 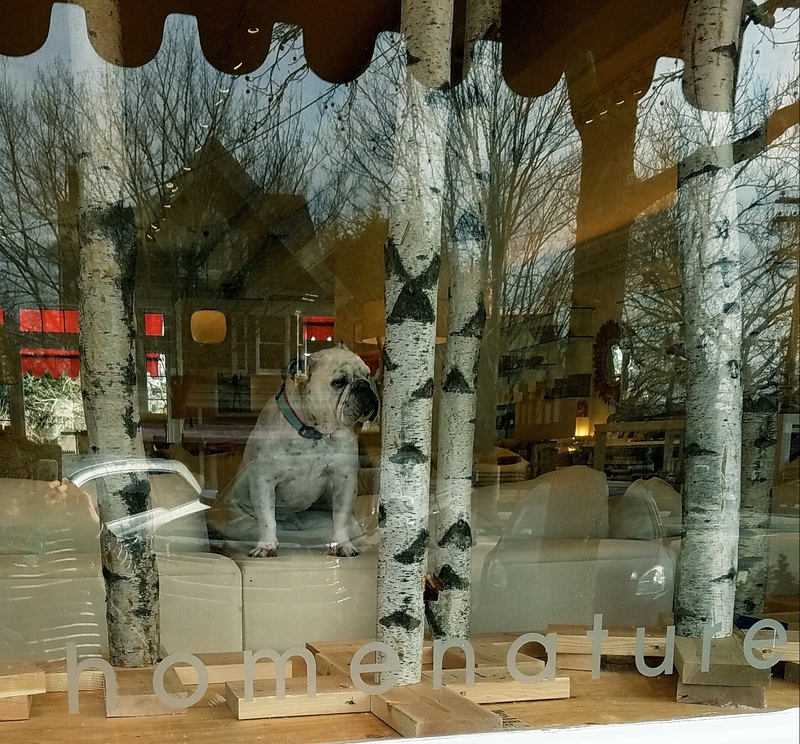 Boiled down, it’s an upscale General Store in the midst of fashion boutiques and a real, worthwhile local attraction. EAT: Saaz Indian Cuisine. This fantastic Indian restaurant is one of those “local favorites” that has fast become a Yelp darling. There are people who stop here “for a treat” on their way to Montauk, and after having the buffet lunch ($15), I can see why. Tandori Chicken spiced three ways, Lamb Vindaloo, veggie samosas, salads and deserts were all wonderful as was the service. 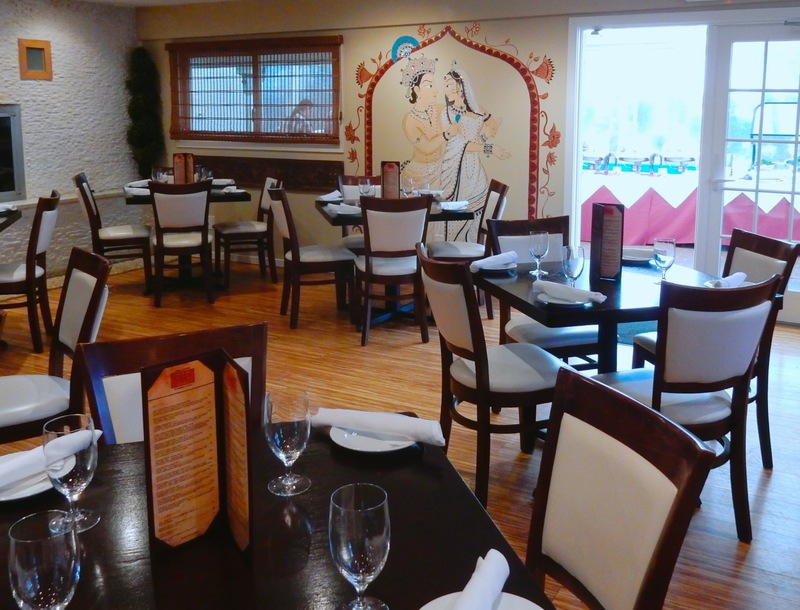 And, given that the prices are very reasonable for the area (highest $30 for Lobster Tail Masala and other signatures, but most entrees in the $15-$25 range), having a meal at this excellent upscale spot is a no-brainer. EAT: Plaza Café. For those staying at the Southampton Inn, you’re in luck. This pricey (most entrees in $45-$52 range) but excellent fine dining local ingredients, seafood establishment is right across the street. EAT: Little/Red Café, Jobs Lane. Fantastic salads and perfect Tuna Tartar in a bar-clubby atmosphere. 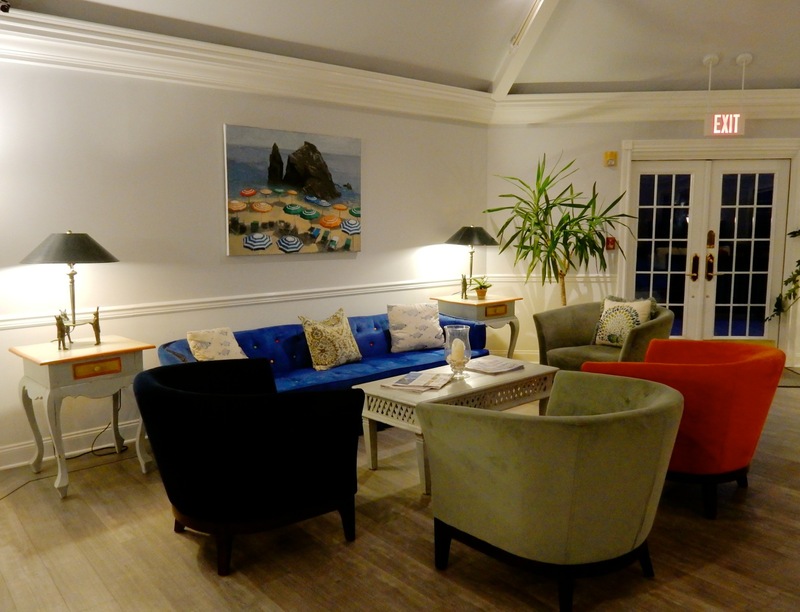 STAY: Southampton Inn. The first choice of most visitors to Southampton, naturally, would be to stay with friends or family, especially if those important people have a huge house on the water with ample room. 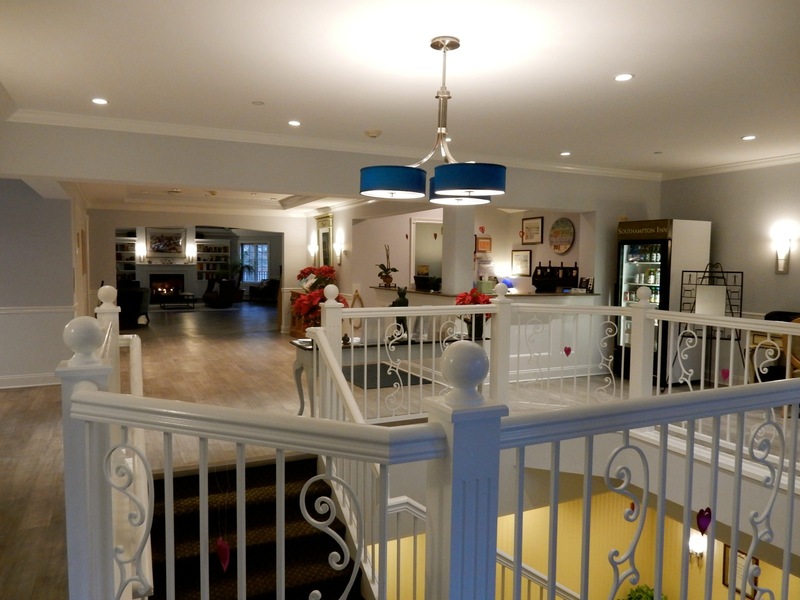 The second choice, especially for our readers who don’t have those kinds of relatives and require a more modest overnight rate for a room that won’t insult their design sense, should be the newly renovated Southampton Inn. If you’ve stayed here five or even two years ago, you might question this recommendation. The Southampton Inn had devolved into what I would kindly refer to as a “faded glory” hotel. Though the sprawling brick building still looks more like a motel than a swanky in-town hotel on the outside, be assured things have improved considerably within. Today, enter the front door into a fresh, stylish reception area and living room like lobby, and all bad memories will fade away. 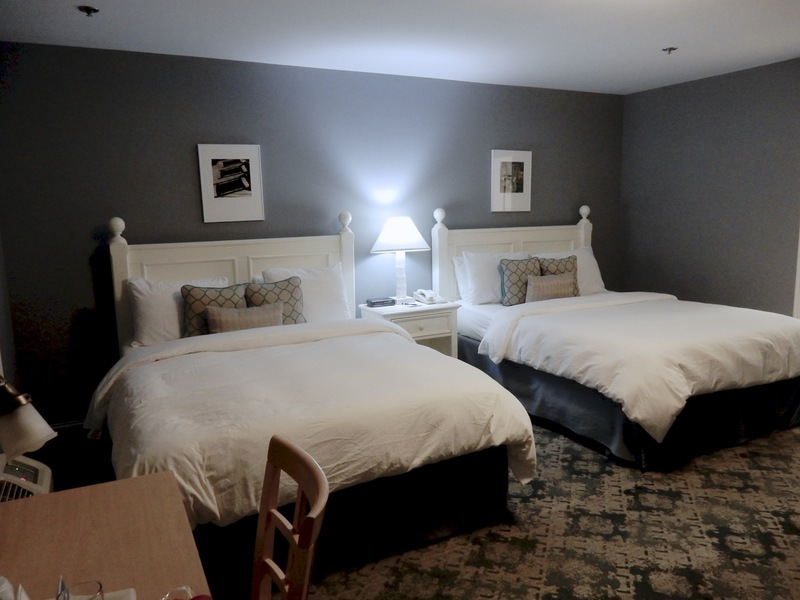 Renovated in mid 2016, rooms are nicely designed with deep-colored walls, Temperpedic Beds, small but immaculate white tiled bathrooms with black and white mosaic floors, flat screen TV’s and not a brass drawer pull in sight. 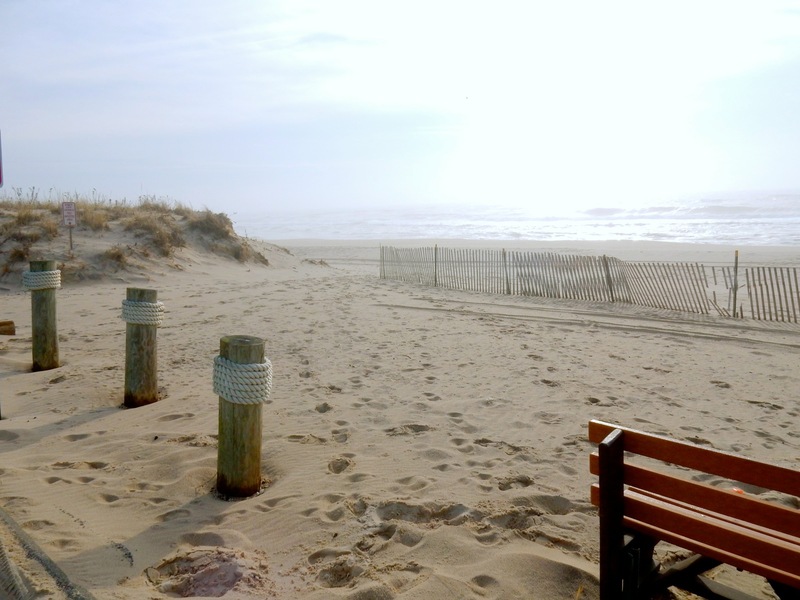 Yes, there’s still a pool, tennis courts, shuffle board, incredibly fresh mini bagels for Continental Breakfast each morning, and free shuttle service to Coopers Beach, adding value and elevating it to a higher level lodging. 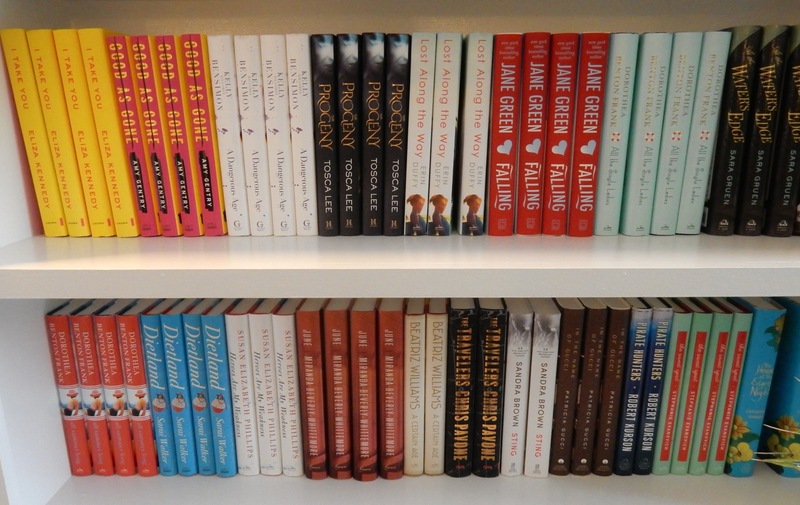 And here’s a unique perk you’d never expect (and I’ve never come across anywhere else): you can read and take home a newly published book for free. Every year before Memorial Day, a publishing house holds a conference here and brings cases of New Arrival Books as a gift; many in multiple copies. These go up on the shelves in the lobby, and are offered, complimentary, to guests. 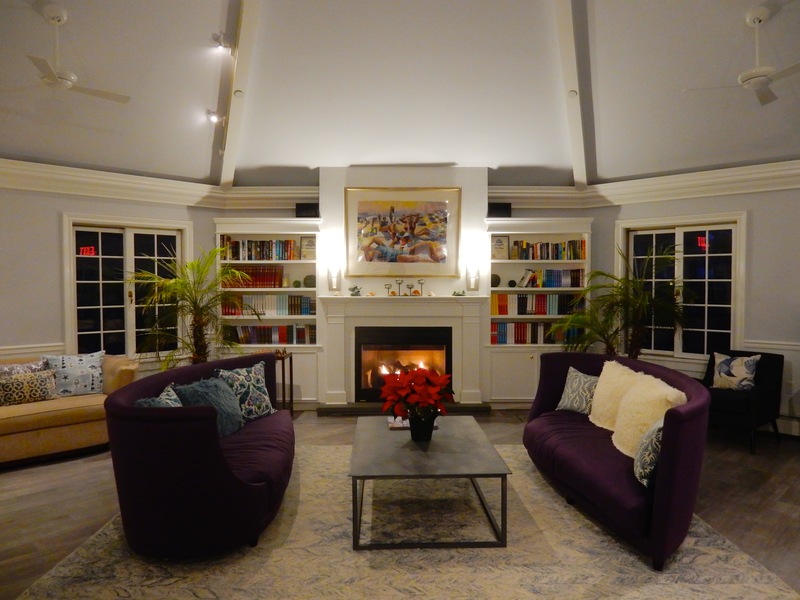 Rooms rates from $159-$525 depending on season and day of week, include shuttle to Coopers Beach, wi-fi, Continental Breakfast and choice of newly published book while available.